A dental implant is a replacement for a missing tooth. Natural teeth consist of the crown and the root. The crown is the visible tooth that is covered with white enamel. Supporting the crown is the tooth root which extends into the jawbone. The root is the part of the tooth that supports the crown and extends below the gums into the jawbone. A dental implant replaces a missing or unrestorable root. There are commonly three parts to what is described as an implant - the implant itself (which is inserted directly into the bone); the abutment - the part that connects the implant device to the third part - the crown or denture. Today's implants are made of a titanium alloy, a metal that is bio-compatible and offers strength and durability as well as a unique property of fusing directly to bone. Most likely, if you are reading this, you or someone you know has lost teeth. Whether they were lost through an accident or cavity, dental implants are an excellent tooth replacement option for nearly everyone. With dental implants, you can eat most foods you want, depending on the type of implant restoration because these new teeth are strong and stable - they look and feel like your own natural teeth. They give you back your smile. If you feel that dental implants could be a viable option for you, contact us to schedule an exam. It is not acceptable to proceed with implant treatment if there are areas of untreated disease of teeth, gums or bone, as these can affect the success of your implant surgery as well as the integration and maintenance of the implant itself. Therefore, a thorough full-mouth examination should be performed. This allows Dr. Herrera to also assess your bite (occlusion) which is important to the success of the implant restoration. What can I expect to happen during the exam process? 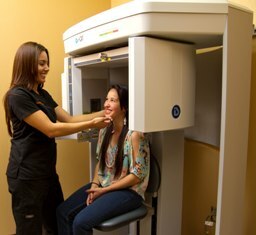 Dr. Herrera will take x-rays of your jaw, paying special attention to the area which will be treated. A review of these x-rays will allow Dr. Herrera to carefully check for other dental and bone disease, as well as to assess the height of available bone and the relation and position of other anatomic structures. Cone Beam Computed Tomography, or CBCT, is an accurate form of x-ray imaging currently used by Dr. Herrera to diagnose, analyze and devise treatment plans for implant surgery. 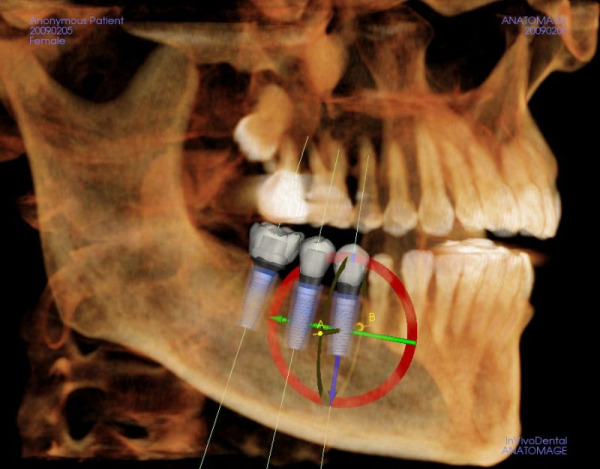 CBCT scans provide very detailed, 3-D images that can measure the height, width and thickness of bone, as well as locate nearby important anatomical structures such as the sinuses and nerves. At Concord Dental Care, we utilize what is widely regarded as the industry standard in cone beam technology, iCAT. A CBCT scan will be taken during the diagnosis process, providing Dr. Herrera with precise data and measurements and enabling him to calculate the perfect and safest implant position. Dental impressions are needed at various points of treatment to assess the status of your bite and proceed with proper restoration of the implant(s) in coordination with the rest of your entire dentition. Photographs may also be used to help plan your treatment as well as record your progress. The dental implant procedure is performed at Concord Dental Care. Local anesthesia is usually adequate for this out-patient procedures but various other forms of sedation (such as nitrous oxide, and oral/intravenous sedation) may also be used. Supplemental surgical procedures, such as gum or bone grafts, may be performed as separate procedures or at the same time as implant placement. Each surgical procedure is different depending on the clinical situation as well as the preferences of the patient and Dr. Herrera. Why is the surgical procedure a staged process? The most widely practiced method of placing dental implants is a "staged surgery" procedure. Step 1: Dr. Herrera inserts the implant and lets gums heal, typically for 3 months. Step 2: Dr. Herrera checks the implant for its successful integration and connects an abutment post. The gum heals around the abutment for an additional month. Step 3: Fabrication of a new crown. Often, Steps 1 and 2 can be combined, reducing the number of appointments and allowing a new crown to be placed in less time. Healing times for implants vary depending on the quality of the patient's bone and overall healing ability of the patient. In general, dental implants require 3-4 months to stabilize (without being exposed to extra forces from biting). In recent years, research has demonstrated that in certain circumstances, implants can be immediately loaded either the same day (Teeth-in-a-Day) or shortly after they have been placed. However, the best results for most cases require a thorough healing period before the final restoration. Proper care of your implants is important to their continued function and good health. While they are no longer subject to cavities, they can develop gum inflammation, and even infection and bone loss if not properly maintained. We will review proper techniques for keeping your implants clean and the surrounding tissues healthy - but above all else, routine brushing and flossing is necessary. This young woman fractured her porcelain bridge which replaced a missing incisor. Rather than cut down 2 perfectly good teeth for a conventional cemented bridge, she chose to place a single implant. This gentleman had severe upper bone loss due to long-time use of an poor-fitting denture. Dr. Herrera performed major bone augmentation which allowed placement of 7 implants and a permanently screwed-in complete set of upper teeth. This patient chose not to wear a removable partial denture. Dr. Herrera placed three implants on each side and implant bridges were screwed in place allowing this patient to enjoy eating again. This patient's permanent front left incisor and canine never erupted so her childhood dentist added some filling to make her front tooth look as wide as the other. Unfortunately, the baby tooth still looks short and over time has become darker. Plus, the left lateral incisor hides the left canine. After tooth whitening, Dr. Herrera placed two implants and a porcelain crown to restore this fun lady's smile.